We want you to join our Juniors crew! We have an incredible crew of rowers from all across the Wichita area. The Wichita Rowing Association Juniors program provides young women and men the opportunity to train and race while building teamwork, dedication, and respect in a supportive and competitive environment. The WRA Juniors rowing program is for youth who have completed seventh grade and ends with high school graduation. We welcome rowers of all abilities and backgrounds. Area schools currently represented include Andale, Andover, Derby, Goddard, Maize, Valley Center and Wichita. The Juniors practice and compete year-round traveling to local and regional regattas. You do not have to be an athlete to join. ...The lessons I have learned through rowing have completely shaped my personality and character. I have been able to compete at a collegiate level against some of the most renown colleges across the country and also the national level against some of the sports greatest Olympians. Rowing is an art, a sport, and a passion. It is hard work, day in and day out, but the feeling of fulfillment from this sport is unmatched. You don't need to be great to start, but you need to start to be great. If you are looking for a place to fit in, an outlet for travel, or a chance to find success through hard work, rowing is a sport that will teach you more then you ever thought imaginable. A natural progression for high school graduates from the WRA Juniors program is to compete on the collegiate level in rowing programs at Wichita State University, Kansas University, Kansas State University, and Oklahoma City University, with many receiving rowing scholarships. Trinity HS graduates Sydney B., Sydney F. and Grant S. have all rowed for the WSU Shockers. Wichita North High’s Hanna S. & Bailey S. received rowing scholarships as freshman in KU’s NCAA Women’s Rowing program. 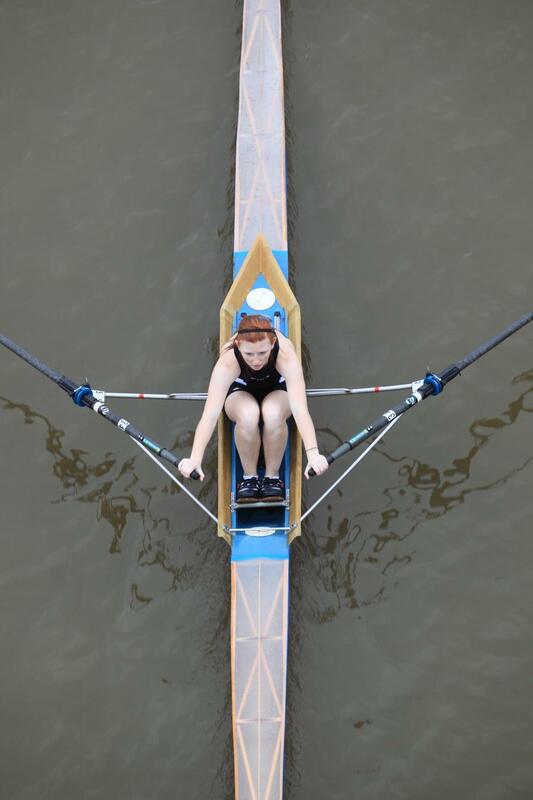 Trinity High’s Liz M. received an NAIA scholarship with Oklahoma City University and rowed in several national regattas winning first place. Click here for a map to the rowing area. We would like to invite you to come and watch a practice at any time to see what Juniors crew is all about. Juniors membership dues are $55 per quarter (spring, summer, fall, and winter sessions). Juniors membership includes experienced rowing coaches for practices with all equipment provided (boats, oars, and ergometers). No equipment is needed besides shorts, shirts, socks, and a water bottle with a sock over it. Ready to Join us! Click on these three forms, fill them out, and bring them with your completed swim test to practice. Feel free to contact our coaches for questions and, if interested, if you would like to offer car pool assistance! Feel free to contact our coaches (as seen above) for questions and, if interested, if you would like to offer car pool assistance!